The second half of Bride of Project Horror begins with my Directors Showcase. The movies in this block don't have any common theme, but they're all made by directors whose other work I've enjoyed. 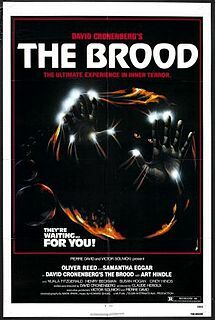 First up, The Brood, directed by David Cronenberg, who made two appearances in last year's project: VideoDrome and Dead Ringers. The main character of The Brood is Frank, a divorced father whose ex-wife Nola resides as a patient in Dr. Raglan's institute. The doctor has created a new type of treatment called psychoplasmics which reaches deep into patients' minds to cure them of mental disturbances by having patients experience the physical manifestations of their suppressed emotions. That description is a mouthful, but it becomes important later. When Frank notices scratches and bruises on his young daughter, Candice, after one of her visits to her mother, he makes plans to challenge for full custody and informs Nola of his intentions. Nola continues her therapy sessions with Dr. Raglan, and as she identifies people in her life who have caused her pain, those people begin to die violently. It appears at first that they are being killed by children, but we learn that the killers are actually strange dwarflike creatures who are not quite human. What are these creatures, and how are they connected to Nola's rage? This was obviously made on a much smaller budget than Cronenberg eventually grew accustomed to working with, but it still holds up. The character of Dr. Raglan could have easily been played as an evil mad scientist, but instead they made him a conflicted character who really was doing what he thought would help people. Child actors are so often the weakest link in horror movies, but the actress who played the daughter did a good job in this one. Best of all, though, is Samantha Eggar in the role of Nola. I say this to her credit: the single scariest scene in the entire movie has nothing to do with the strange little creatures or people being killed, it's when there's a close-up shot of her face near the end of the movie. There's no special makeup effects or anything like that, it's just that her face is so crazy and intense that I actually had to look away from the screen for a moment. SPOILER - I also really liked the idea of the creatures being physical manifestations of Nola's rage, and of her being their psychic mother. There's probably been some other horror movie that lifted this idea at some point, but I can't think of it right off. I give The Brood five Killer Dwarfs tour posters out of five.